Has your fine jewelry seen better days? Why not bring your cherished pieces to KP Jewelers, where our expert jewelers will make them look as good as new. Is your favorite chain broken, or are the prongs on your engagement ring wearing thin? Perhaps your ring is a bit too loose and needs to be sized. Or your white gold ring is looking dull and can use some rhodium plating. 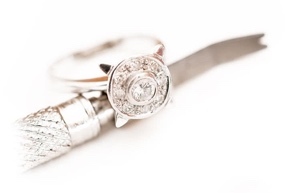 We will evaluate your jewelry and give you an estimate for any repairs that may need to be done. Our shop is equipped with the latest technology so every repair will be expertly done to our meticulous standards. Come in for a free estimate today!